I’m loving doing these each week, to tell you the truth. Doing forecasty things on a regular basis for me has peaked with monthly videos and mp3s for my subscribers, and occasional Facebook/Twitter musings. Doing this weekly nourishes my astrological thought process, and I hope you’re digging them, too. 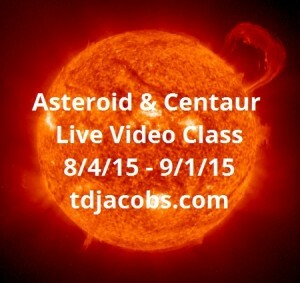 Most of these archetypes will be covered in the Asteroid & Centaur Live Video Class beginning August 4th. On my site you can already access courses that teach my approach to analyzing the karmic stories in birth charts, understanding family dynamics from the soul’s point of view as shown in the birth chart, an entirely rad in-depth trek into the land of Lilith to heal our relationship with the divine feminine within, and others. (See all of my astrology courses here.) Adding a course on how I work with lesser-known and -understood bodies is a great addition to the process of bringing you into how my astrological mind works. As usual, I’ve chosen 9am Pacific time for this chart. I’m offering a snapshot of what’s happening now and a general look at what will unfold this week with these archetypes. Ceres is still retrograding in Scorpio, still in square with asteroid Lilith (1181), which stationed in the last two weeks and began direct motion again. Ceres has been asking us to review who’s in charge of nurturing and protecting us. Ideally, we’re open to gaining objectivity on our expectations of self and others. If you’re in the right groove, you may find you can no longer (or not right now) give what others seem to expect of you at the same time as feeling hiccups in trying to get what you need from others. When an Aquarian process touches the energy of nurturing, we often don’t feel nurtured. We may expect softness and, instead, get seemingly disconnected logic. The square to asteroid Lilith is about friction between those expectations of self and other related to expected gender roles. In other words, look now at what you’re not getting or not giving in the nurturing realm and try on viewing it in terms of expectations seeded in you from youth, when you were being imprinted upon left and right by how others did and didn’t nurture self and other. Are women supposed to be nurturing? Are men supposed to be protective? Play with such questions and observe any tension that comes up as instructive and serving you in evolving your methods of being a stand-alone adult. Vesta in Aries demands that you identify something you can devote yourself to serving. Square Mars and Mercury in Cancer now, personal and collective concerns may be rubbing up against each other in a not-fun way. Instead of trying to rephrase what I wrote last week with what I think seems like a nice form of clarity, “This says there’s a pair of impulsive strategies regarding what needs to happen. One serves you and one serves you-as-someone-in-service-to-something-sacred. There’s a big difference. The square between them will seem to reveal an innate competition between them, but can instead – with conscious intent – serve to make light of egoic and extraegoic needs, each of which has value during the human trip. Let the friction of the square tell you what needs doing now and why.” The addition of Mercury to the conversation says that conversation about priorities is ready to happen. Think before you speak, precisely because you’re passionate about the thing in question. Juno in Virgo is being approached by Venus but the latter will station in early Virgo before a conjunction occurs. There’s now the beginning of a hint of a whiff on a distant breeze you can kind of smell, and it’s telling you to evaluate how what you’re committed to makes you feel. Is it good? Does it bring you something (Venus in Leo)? Does it ask a lot of you with no time to play (Juno in Virgo)? Sort through anything that comes up about this because whatever it is that you’re committed to, there’s a reason … even if it’s to reveal that you might commit to something because it seems to need doing and no one else seems to care (Juno in Virgo). Still square to Saturn retroing in late Scorpio, you may feel you’re undergoing a challenge to step up to your commitment challenges but finding your rhythm and resolve not up to par. If so, this means that you need to double-check the truth of why you committed to the thing in the first place. You may have changed energetically/on the inside to the point that it’s no longer healthy for you to play in that sandbox. The true Black Moon Lilith (BML) is in that mix, too. She adds the imperative that you align with instinctive truth and make proactive, self-interested choices that lead to better energy management. If you’re leaking energy due to the wrong commitments, you’re not possibly able to invest in, develop, and share the best of yourself. Finding out that you need to redirect the energy flow/expenditure in your life is a normal Virgo process. Bodies and points working through the lens of Virgo find themselves in need of trimming what’s not useful and focusing efforts on what is. In this case, with the true BML, it’s about letting your body, energy, and biochemistry (true BML) show you what in your life needs editing (Virgo). Better choices made after analysis of past choices is a Virgoan skill, by the way. Juno and the true BML are still opposing Nessus in Pisces, which is traveling with Neptune in Pisces for a while. Nessus themes include ferrying others and purporting to be civilized while trying to manage animal urges of various kinds. In the mix of this dialogue with Juno-true BML square Saturn, Nessus can chime in with confusion and tension about how what you’re committed to feels to be not helping you get where you ultimately need to go. Any reality check about the truth of where commitments and responsibility in your life come from (the Virgo stuff squared by Saturn) will include some perhaps vague-seeming variables (Pisces) to do with what you really want and don’t want deep down in your primal self (Nessus’s animal instinct). To me, this looks like a chance to change course re commitments if you can allow some non-logical (not illogical!) input from the animal inside you. Neptune in the convo wants you to align with what vibrates as true as a guide to doing, thinking, and believing. Sometimes that’s hard for us pesky mortals with these hungry egos, but Neptune promises that you don’t need to overwork your ego to get where you crave going if you allow life to work with you by aligning with truth. Eros (433) and Lucifer (1930) still lead the Sun in Cancer, indicating that passion (Eros) and the urge to bring light and love (Lucifer) are out ahead of our awareness of the logical sense of what’s unfolding (Sun). All three are trine retro Chiron in Pisces, which is bringing in subtle energetic awareness to the conversation about Cancerian themes including belonging, how needs are approached, and family/community issues. Now is the time to let yourself feel what you’re wired to feel as you intentionally ground yourself to the point at which you’re not swept away by the internal waves of memory that are circulating in your emotional field (as they do for all of us until we ground effectively). Let yourself flow, but consciously work to center as you feel so that your relationship with energy and the emotions it inspires is not in charge of you. The importance of this for those seeking to evolve as humans cannot be overstated. Persephone (399) in Aries has passed Uranus, on its way to Eris. Something happened over the past week that made you see you are, in fact, capable of growing up and leaving behind something that makes you feel trapped. (Whether you acted upon it or not is another story.) This Aries stellium is trine Jupiter-Venus in Leo, activating a dynamic in which you’re invited to believe in yourself and the value that you have to offer as a unique individual … and prioritize that over the way things are or have been, and/or your vision of how something in your life now was supposed to be different and you think you should hang on with it because it still, you know, um, you guess, errr, could be. “Enough!” says Persephone, who has just graduated from the boring and unfulfilled side of the Uranian archetype, now more grown up and ready to call the shots in her life no matter what parental/authority figures and tall, dark strangers think. As she approaches Eris, look now at what bold change you’re not making because you’re afraid to hurt someone’s feelings. Arjunsuri has been passed by the Sun in Cancer, revealing to you the importance of conscious choice (Sun) based in inner wisdom. You’ve recently been challenged to act only on what feels right and true to your energetic innards, another step in the ongoing human trip you’re on to explore the ins and outs of learning to trust your inner compass. Arjunsuri is opposing Pluto for a bit longer, nudging a calling to align with a deep sense of purpose into the conversation. If you feel some unstoppable force standing in the way of doing what you know you need to do, realize the time may not yet be ripe to do it. Or, maybe, you need more information, which in this case is about more evaluation of that relationship with inner wisdom. Feeling blocked now doesn’t mean what you need/want to do is a bad idea or not allowed. Let things brew and be aware of thoughts, feelings, urges, and frustrations that might sweep you out of center. Tom Jacobs is an evolutionary astrologer, energy worker, and channel with a global practice of consultations, tutoring, and teaching. 15 books, 2 natal reports, a wealth of astrology and channeled audio, and programmed/charged crystals for healing and meditation including the new onyx pieces for Plutonian issues of all kinds are available via tdjacobs.com.